The domain name system (DNS) is mostly known for associating names with IP addresses, as humans can more easily remember names than numbers. Also software and hardware on the internet name things, including web browsers, e-mail applications, gaming consoles, or video streaming devices. The DNS is flexible and not linked to a device or location, i.e. a domain name stays the same even though the underlying IP address might change. The DNS has a lot of built-in redundancy to ensure reliability: if a server is not reachable, it can rely on multiple others that store the same data. For applications to work and/or communicate with each other via Internet protocols, domain names need to be translated into IP addresses. This process is set off by a query, i.e. when you want to send an e-mail or wish to access a website. How does a query work? The DNS is a hierarchically organised system, where different organisations exert control and influence over their particular domain at different points in the process of the query. The root zone database is managed by IANA, a subsidiary of ICANN, hundreds of root servers are managed by 12 organisations, for example RIPE NCC and Netnod in Europe. The TLD name servers are managed by ccTLD or gTLD registry operators, and anything below that either by web hosting companies or DNS operators on behalf of the registrants or the registrants themselves. Once you type a domain name into the browser, the computer will ask the a DNS resolver (typically run by your ISP) for the domain name’s IP address, e.g. www.example.eu. The resolver starts by asking “at the top”, i.e. the root name server for the IP address of the DNS (registry) server (to find the TLD .eu). The DNS resolver then asks that DNS registry server for the IP address of the DNS server (to find the second-level domain, example.eu). With this information, the DNS resolver can finally ask the IP address for www.example.eu, passes it back to the browser, which then contacts the website host using the IP address. HTTP traffic begins: you can see the webpages and their content. Note: No internet traffic passes through the root or DNS servers at all. They are not involved in routing. Name servers answer queries from other parts of the DNS. In a rough analogy, name servers could be compared to the telephone directories of the internet age. Caching: In most cases, a query does not have to go all the way to the root, but your computer can retrieve the response from a nearby caching server (usually operated by your ISP), which has the information readily available. This considerably speeds up the process. There are many different parties involved in the operation of the Domain Name System. The companies that run the top level domains are called registries. They maintain the database that contains all the information about their zone. That database is called the zone file. The companies that sell the domain names to website owners are the registrars. Typically they do not only sell domain names but provide a wide range of additional services such as hosting, internet access or website building. The organisation that is in charge of coordinating the global policies for the domain name system is called ICANN (The Internet Corporation for Assigned Names and Numbers). Where does it fit in the internet ecosystem? The Domain Name System (DNS) is part of the technical layer of the internet. Packets travel between connected devices over the infrastructure built by Internet Service Providers and according to protocols agreed upon by the Internet Engineering Task Force (IETF) and the Internet Architecture Bureau (IAB). All of these packets receive an IP address managed by their Regional Internet Registry (RIR). The DNS adds a level of usability and security. 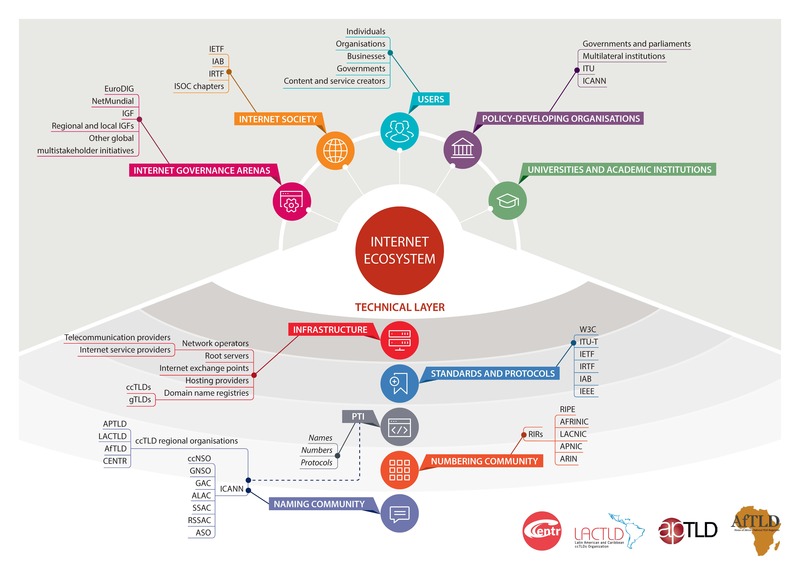 The image below shows that layered structure and puts it in the context of the internet governance ecosystem. You will find the DNS' main actors in the bottom layer.